It’s been nearly three years since The Legend of Korra left our TV screens, ending with Korra getting her happy ending, Asami by her side. It’s been two years since we first learned that the show’s story would continue as a comic courtesy of Dark Horse. Finally, Legend of Korra: Turf Wars Part One has arrived—and it’s an outstanding return to Republic City. It might have been three years since we saw Team Avatar triumph over Kuvira, but Turf Wars—written by series co-creator Michael Dante DiMartino with art by Irene Koh, Vivian Ng, and lettering by Nate Piekos—picks up immediately after the events of Korra’s third season. Like, seconds after, because the first thing you see is Korra and Asami stepping through the newly-created portal into the spirit world for their well-deserved vacation. At first, trying to reconcile the fact that it’s been years since we last saw these characters while Turf Wars is set in the days immediately following the end of the show is tough. Fundamentally, these characters are exactly the same as when we last saw them: Korra is still a hothead, as quick to get overexcited about telling her parents about her new relationship as she is to get angry at the injustice of the displacement caused by Kuvira’s assault on Republic City, although now she has the benefit of Asami by her side as a calming influence. Mako and Bolin are still the straight man-and klutz-partnership—literally, now that they’re working together as part of the police. 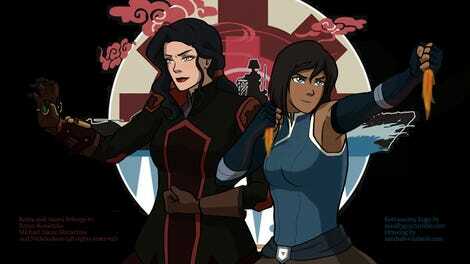 Kya and Tenzin have been reduced to smaller roles, but they’re still as supportive of Korra as ever. There’s President Raiko, still as slimy and unscrupulous as ever. But once you re-orient yourself, Turf Wars’ familiarity becomes one of its greatest strengths, because it really does end up feeling like you’re reading the premiere of Korra season five. After reveling in a few consequence-free pages of Korra and Asami’s vacation, Turf Wars quickly reminds you that the end of season four was by no means a definitive ending for the show. Both Korra and Kuvira’s actions in the finale have ramifications that almost immediately become apparent when the Avatar finds her vacation cut short, and the two sides of her life find themselves in discord once again. The creation of a new portal to the spirit world in the heart of Republic City leads to anger from both spirits (who are sick of humans trying to encroach on their world) and the city (including shady businessmen, who see the portal as a new way to exploit people for money). Meanwhile, Kuvira’s invasion has lead Republic City into a new immigration crisis, as refugee encampments struggle to deal with displaced citizens, and dwindling reserves—that Raiko would prefer to use to prop up his beleaguered re-election campaign—lead to the government struggling to repair the damage left behind by the attack. As ever with Korra, both aspects of the Avatar’s life—as a spiritual leader and as a prominent public figure—come together in the establishment of a new villain: a gang leader called Tokuga who quickly goes from exploiting Republic City’s crumbling infrastructure to a pretty serious future threat for Korra and her friends. While it falls into the larger themes Korra covered in the past—specifically the ones starring Amon and Zaheer—the new story DiMartino establishes in Turf Wars feels like a logical continuation of where the show left off, rather than a shoehorned expansion of a story that had reached a solid conclusion. In that way, Turf Wars could feel like it’s a bit more setup than some would like—especially after fans have waited so long for the comic to come out. But while it also spends a lot of time establishing a new arc for Korra and her friends to go on, it spends just as much time examining the relationship between Korra and Asami that fans have been dying to see ever since the show came to an end. Honestly, it’s much more satisfying on a character level than in terms of its story. The exploration of the pair’s burgeoning feelings for each other forms the emotional backbone of the comic, as they navigate attempting to tell those closest to them that they’re in a relationship together. If you were disappointed by the show being unable to tackle LGBTQ themes until its final moments (and even then, only after later confirmation from its creators), Turf Wars has you covered and then some—not just in the nuanced way it handles the awkward teen feelings that accompany young love (something the show had a lot of experience with already with, given Korra and Asami’s previous romantic entanglements) but for how it ultimately leads to some surprising revelations about other members of the cast. It also provides insight as to how Korra’s world generally treats LGBTQ people, in addition to some rather adorable moments between the couple. Another thing that feels wonderfully familiar about Turf War is its art. Irene Koh strikes an excellent balance between feeling familiar to the style of the TV show while also being a bit more relaxed and loose, giving the book its own sense of style. It’s effective at depicting both tender character moments and kinetic action sequences that wouldn’t feel out of place among the highlights of Studio Mir’s oft-lauded animation. Paired with Victoria Ng’s sumptuous color work—which adopts a much warmer palette compared to the show—it leads to some really vivid, sumptuous vistas, especially in scenes set in the spirit world. Turf Wars never feels disconnected from its source material on an aesthetic level, something that can often be a challenge for licensed comics. It all comes together to create a comic that feels right at home in the world of Legend of Korra. 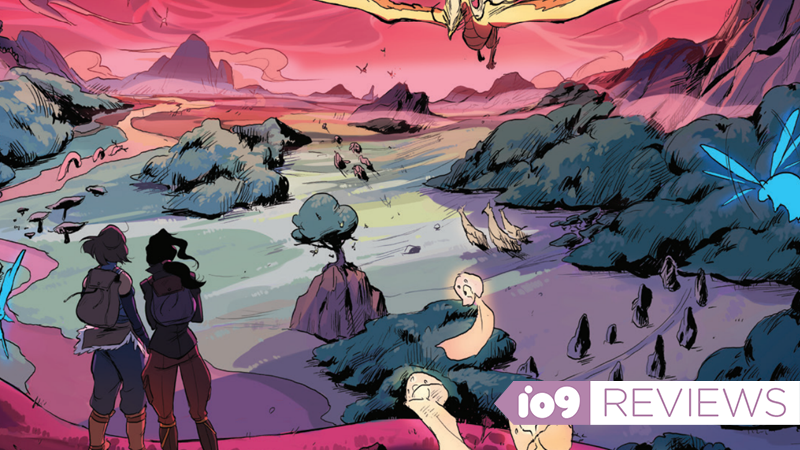 Turf Wars is everything a Korra fan could ever want from a continuation of the series, setting up intriguing new conflicts and deepening the relationships between characters we have known and loved for years. While it’s not in a format fans who want to see the show return to screens might have preferred, it’s a more-than-welcome alternative. Most importantly, it feels right at home among the animation of Studio Mir. 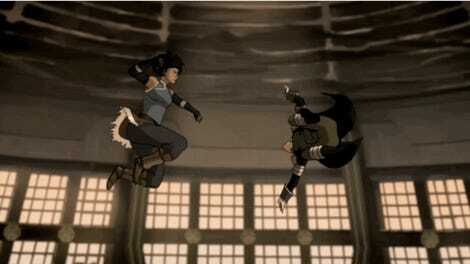 It’s been a long wait to see Korra and friends make their journey from screen to page, but it was very much worth it. These Are Our Avatar Blogs, You Gotta Deal With It!